But all I need to do is take a few steps - and I am back in the zone. I'm running, I'm where I belong, just me, my Newtons, and the road leading to all sorts of adventures. 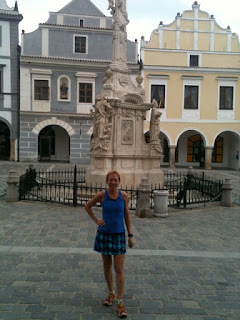 Last week in the Czech Republic, I was able to get a run in on the last day of our 8 day bicycling trip. It was a tough, long ride, and it had to be done fast so that we could spend a half day in Cesky Krumlov, a charming medievel town. That meant it was a ride for Larry Bishop - Dan and Caroline, Liana and Josh, and I were not up for that ride. So after Larry took off with our guide Hana on the ride, I took off for my only run in 11 days. I started at the Plague Column. Just about every small town in the Czech Republic has a Plague Column, a monument built by the survivors of the plague during the Middle Ages, thanking God for sparing them from the disease. The column is always smack in the center of town. Several times when we would split up to shop, we would say to the kids, "meet you back at the Plague Column". So I figured that would be a good place to start. My ulterior motive was that if I got lost, I would look for this tall structure and that would be my beacon back to the town square. I am very directionally challenged even in my own country, so in a country where I can't speak the language, any help I can get, even from a centuries old statue, is gratefully appreciated! Running in cool high 50 degrees was invigorating. I had been running slowly in Florida the last few months - it's tough to run in mid 90 degrees and about that percentage in humidity, and for several hours. I was kind of down about my slow times, although happy to be running uninjured and pain free. 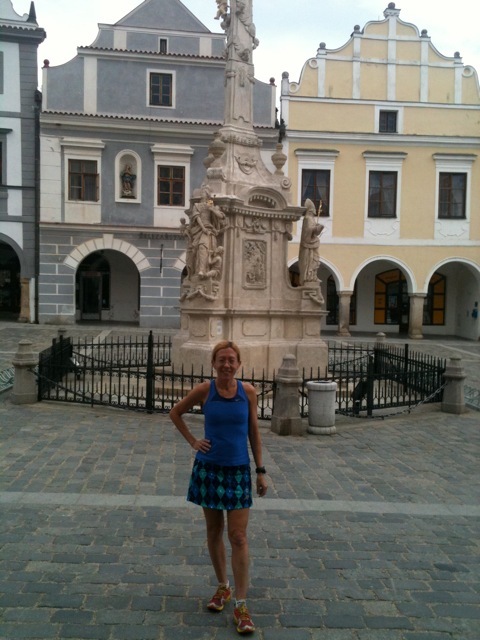 But it was this run in the Czech Republic town of Trebon that made me feel like I was flying again. I ran fast, for about an hour, enjoying the sights of parents walking their kids to school, adults going off to work, and there was that guy in an Indiana U. sweatshirt riding a bicycle! Go Hoosiers, Dan's current university! Most fun of all was another local (not wearing an American university sweatshirt) riding a bicycle, who rode past me and said, in heavily accented English, "Good morning!" I smiled and answered back (in unaccented English, unless you count my New Jersey accent I can't seem to shake), wondering how in the world he knew I was an American. My running clothes were devoid of any English words. But I guess it was the running by itself that gave me away. We saw thousands of bicyclists during our Czech trip, but I can't remember seeing any runners. I know I didn't see any that morning during my run. I certainly love a country that is bicycle friendly; but I miss the running community that is endemic all over the US. I finished the run happy to be running again, and happy to have seen more of Trebon, and the regular neighborhoods, that tourists to the center of the town don't see. I would highly recommend visiting the Czech Republic, especially for a bicycle trip. The people are friendly, the castles, the lakes and forests and farmland are beautiful to bike by, the ubiquitous bike paths beat anything in the US. The history comes alive, from the medievel times, through exciting 17th - 19th centuries, to the horrors of WWII and Communism, through passionate local guides. But if you can sneak out for a quick run - maybe I can sneak away with you. See you at the Plague Column!